Help control drivers in dangerous areas while protecting people and property. 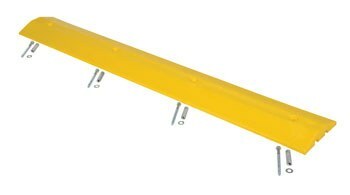 This Speed Bump offers one person installation and holds up under truck and semi-trailer traffic. Can be removed for seal coating, snow removal, or change of location. Resists marring by oil, road salt, sunlight and chemicals. Constructed of lightweight recycled plastic. The concrete hardware kit (included) includes bolts, anchors and washers.